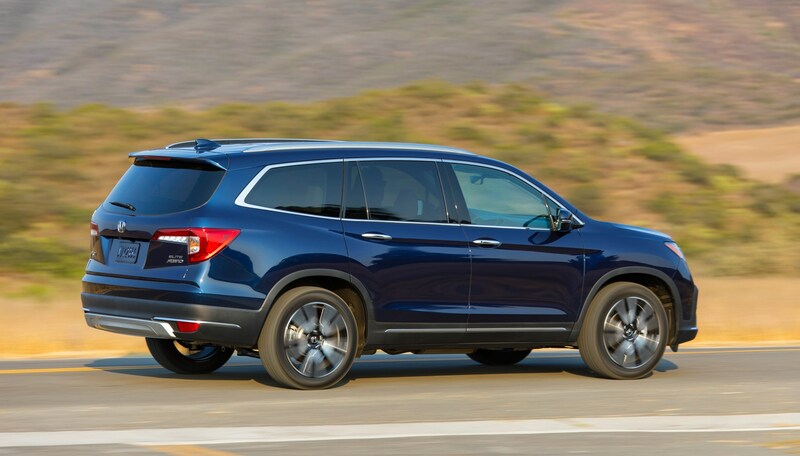 Honda Pilot (2018) review: large and in charge? The largest Honda SUV sold in the UK is the CR-V. It comes with a 1.5 litre engine and measures 4605mm in length. How Mr Trump must laugh, because in the US they build the world’s largest Honda SUV. It’s called the Pilot, it comes only with a 3.5-litre VTEC V6 and, at 4991mm long, it’s more than a ruler harder to get in a parking space than the humble CR-V. We tried it recently in California. 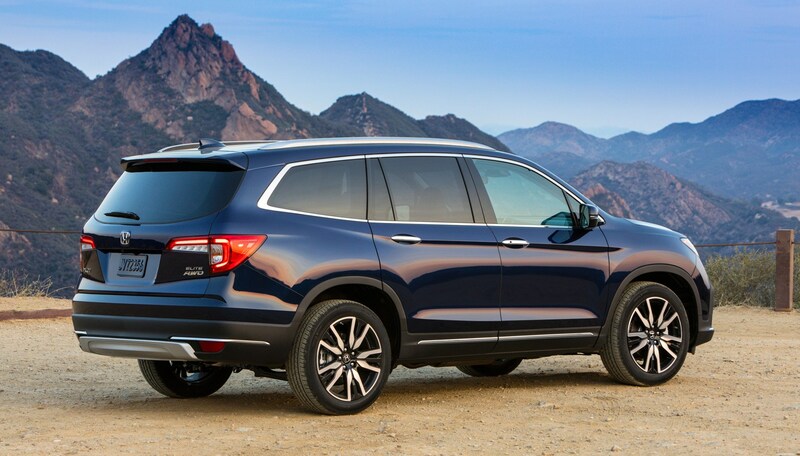 Built in Alabama, the Pilot has been on sale since 2002, with the third-generation model we’re driving arriving in 2016, if recently updated for 2019 as tested. It doesn’t share its platform with any UK models, but it is closely related to the also-US-built Acura MDX, while the Odyssey people carrier and Accord share genes. Its monocoque is mostly steel, with a small smattering of aluminium and magnesium here and there. What does it compete against? How much does it cost? The Pilot goes head-to-head with other domestically produced rivals including the Toyota Highlander and Volkswagen Atlas – another two big, relatively cheap SUVs that aren’t sold in the UK. Pricing starts from $31,450 (approx. £24,500) for a Pilot in LX trim, and rises through EX, EX-L and Touring to the range-topping Elite we’re driving. Priced $48,020 (approx. £38,000), the Elite is the only model with all-wheel-drive as standard – front-drive is standard on other specs, with AWD optional. Other Elite-spec toys include a panoramic roof, wireless phone charger, heated and ventilated leather front seats, heated steering wheel and 590-watt stereo system and a rear-seat entertainment – it’s a lot of kit, and our test car didn’t have a single extra. There are all sorts of driving aids to stop you veering from the road and crash, though Honda has resisted the urge to name it auto-Pilot. Elite specification also introduces second-row ‘captain’s chairs’, providing two individual seats rather than a bench. That means our Elite model gets two rows of two seats and a third rear row for three at a push, for seven occupants in total. But lesser models offer seats for eight. This is a spacious, smart-looking cabin, with a leather-wrapped steering wheel and a digital central instrument cluster that’s flanked by analogue gauges for fuel level and water temperature. Hard, cheap plastics do make it halfway up the dash, but are beaten back from above by softer, posher alternatives that you see and touch more often. The seat bases are quite firm and the bolsters relatively low on support, but these are comfortable seats on a long journey. The best news is the introduction of a new touchscreen infotainment system, with a tile-based menu. It works well (especially the handy nav ‘Where To’ short cut) and looks much like Apple CarPlay, though both CarPlay and Android Auto are offered. Whoever designed the infotainment needs to take at look at the interface for the nine-speed transmission, which is too fiddly, with individual buttons for P, R, N and D that are way out of eye line. It does look a bit supercar, but it’s a right old faff during a three-point turn. A stick’s just easier. How about rows two and three? The pair of captain’s chairs in row two are highly comfortable, and lend a relaxed feel of space and a certain luxury with their armrests and heated squabs too. There’s storage galore, and cupholders far outnumbered our cups. Row three isn’t cramped – there’s plenty of headroom for adults, and row two can slide forward to provide more legroom. I wouldn’t want to trek across America back there, but I’d manage an hour or so. You also get one Isofix mount in row three – often you don’t, and it’s the most logical place to put little ones in a full car. With all seats in place, the boot is pretty small. It’s also a bit of a lift to get stuff over the sill, and there’s a fair chance your precariously stacked belongings will fall out when you next open the tailgate (which tends to beep, like a lot of the car, like you’ve just left Walmart without paying). However, there is a tough and removable plastic false floor. It’s easily cleaned and, when you remove it, there’s a deeper, more secure stowage area. The rear seats are easily laid flat while you’re standing at the boot, with just a quick pull on two Velcro straps required. That simultaneously – and cleverly – tucks in the headrests. It all creates a flat, spacious loadbay. What’s the Honda Pilot like to drive? This kind of car needs to ride well and feel refined at speed, and the Pilot succeeds – you’re impressively isolated from wind-, road- and engine noise at typical US freeway speeds, even over some quite harsh surfaces, and the ride is absorbent and controlled. The engine is mostly smooth, with adequate 280bhp performance given the two tonnes it’s lugging. Kickdown can feel a bit extreme if you switch from gentle to full throttle, with lots of V6 thrashing and not an awful lot of progress, but it works better if you select gears manually via the paddleshifters. Nonetheless, Brits are used to more low-rpm torque in this kind of vehicle – they’d expect a turbodiesel, not a high-revving atmo V6 that doesn’t deliver 262lb ft until 4700rpm. The electric steering has a slightly lumpy, highly synthetic feel, but its lightness at parking speeds makes the Pilot feel smaller than it is, and the standard reversing camera helps in that regard too. Given this is a comfortable, large, heavy SUV, you probably don’t expect it to be scintillating on a twisty road. It isn’t, but it is much better than expected. The suspension retains its composure when driven much more enthusiastically, and the all-wheel drive system adds a feeling of both rear bias and scrabble-free progress – you can sense it quickly calculating what to do, working away like swan’s feet beneath the surface and making heavy, low-gear acceleration out of tighter corners feel quite serene. Use the Pilot’s paddleshifters and there’s a much more connected feeling between pressing the accelerator and actually moving forwards too. You’d never buy a Pilot to sneak out at dawn on a Sunday in search of a great road, but it certainly exceeded my expectations and, really, it needn’t do much more. Given its girth and V6 petrol engine, the Pilot would be a fish out of water in the UK, but it does impress in its domestic market. It looks smart given the affordable pricing, and is generous in its specification, refinement and spaciousness – this is a nice environment to while away the miles. 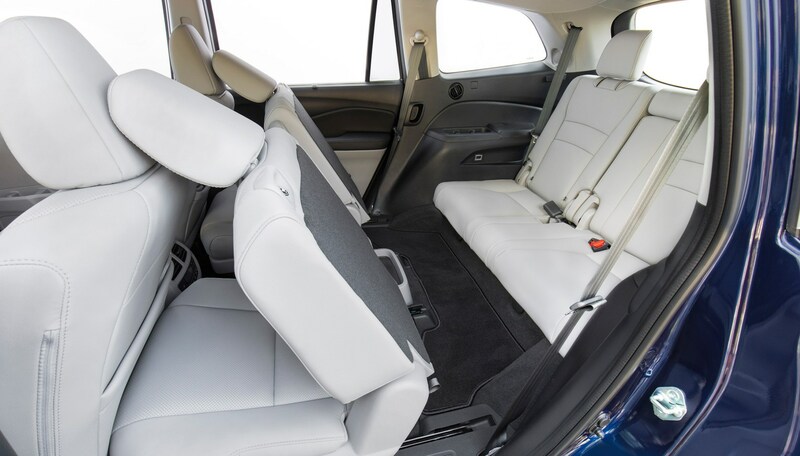 The fact that you can carry up to eight people and configure the interior to accommodate large loads makes the Honda Pilot a particularly versatile family choice.